When you partner with Archipelago International, you'll gain access to our unparalleled expertise in key areas of operation and our powerful brands that instill consumer confidence and loyalty. Beginning with industry best-practice models, we are continually seeking to refine systems and processes and to integrate our operations to increase efficiency and reduce costs. To maximize profitability in today's accommodation industry, hotels must function with the advantage of best-practice operating systems, sophisticated distribution methodologies and leading management acumen. With a mandate of sustainable expansion, Archipelago International is committed to exploring new opportunities in Australia, The Middle East and the Asia-Pacific region for our four brands: Aston (Grand Aston, Aston, Aston City and Aston Inn), Harper, favehotel and Neo. 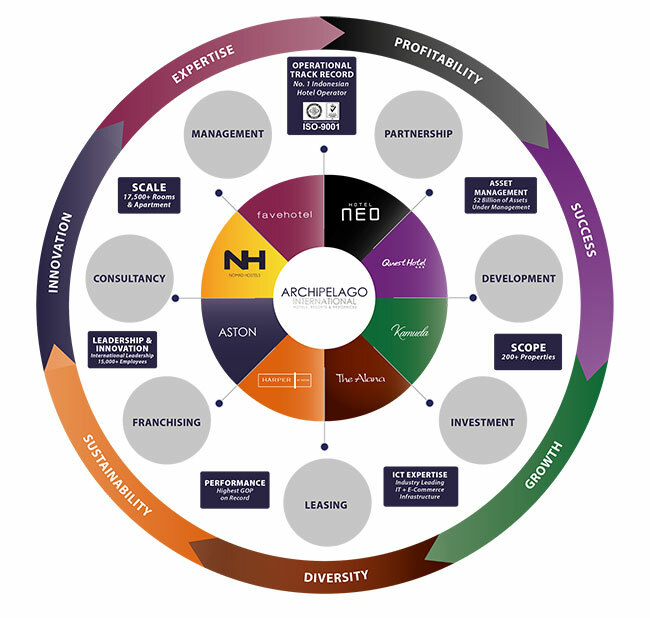 We partner with established accommodation owners, investors, developers of new products and industry intermediaries with a range of flexible hotel operating models encompassing management, franchising, joint ventures, investment and development. Our sales & marketing teams always deliver results. With a $15 million marketing budget, industry-leading public relations and 30 dedicated sales professionals, our key account management, tour operator contracting and overseas trade show revenue streams have been nurtured through years of solid relationships with major industry players. Within our teams there are specialists for the Australian, Japanese and Chinese markets, focus groups for the Indonesian market - one of the future global demand generators - and a presence in all major market segments, including the lucrative MICE market for which we have a dedicated, professional team. Our teams focus on profit over occupancy targets in all properties and we specialize in innovative marketing concepts such as our "no-cost-to-hotels" online frequent guest program. One of our key areas of differentiation is our asset management, which is typified by a focus on maintaining and adding value for our owners. We manage over $4 billion of assets on behalf of owners. Asset value perfomance is underpinned by industry leading gross profit margins of up to 55% and superior maintenance, fire, life and healty & safety programs. More than 95% of our 100 hotels are new-builds, with our expertise saving owners millions in construction costs. We've opened doors to financing, we've added up to 20% in real estate sales value and we've produced attractive hotels that people love. Our experienced architects have successfully built hundreds of hotels, engineered best practices such as energy conservation and vendor relations and have a proven track record of successful project implementation. We provide access to top consultants, designers, banks and insurance companies and we are experts at manning budgets, reliable projections, guides and operating equipment. Archipelago International has invested heavily in building in-house E-Commerce expertise. As an increasing number of people use the internet and social media to become their own travel agents, our owners are reaping the rewards with in excess of $100 million in web revenue. Our E-Commerce department focuses on web design and search engine optimization, lower commissions, preferred placement on leading OTAs, creative e-campaigns, no-cost frequent guest programs on Android and IOS, and seamless channel management and PMS integration. Being an innovative industry leader attracts the brightest of the bright, enabling us to recruit efficiently and effectively whilst nurturing talent from within. With 12,000 employees, our human resources departments initiate internal learning and development programs - a key factor in maintaining the lowest levels of staff turnover in the business and strengthening our ability to send support staff at short notice. Operating at the highest international standards and fostering a culture of continuous improvement has earned us a number of awards and accolades and an online reputation that ranks high on every single review site. We boast a flawless track record for cleanliness and service excellence thanks to regular financial, quality, sales and hygiene audits. 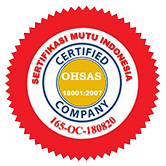 In 2018 Archipelago International received two new certifications - the ISO 14001:2015 certification for implementation of Environmental Management Systems (EMS) and OHSAS 18001:2007 for developing Occupational Health and Safety (OH&S) management systems in compliance with the international standards. 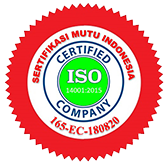 In 2011 Archipelago International received certification for the quality management system, ISO 9001 : 2008. The ISO 9000 is designed to help organizations ensure they meet the needs of customers and other stakeholders. The standards are published by ISO, the International Organization for Standardization, and available through National standards bodies. Third party certification bodies provide independent confirmation that organizations meet the requirements of ISO 9001, ISO 14001 and OHSAS 18001.